We offer a Huge Range of Sacks Trucks. ART No. 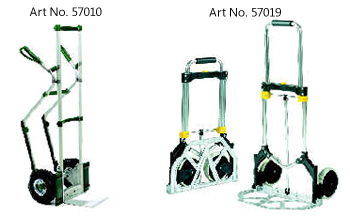 57016 is a 3 position truck that can be used as a magazine truck, magazine truck with foldable support (to relieve the weight) and transport truck. ART No. 57015 is a 2 position truck that can be used as a magazine truck and transport truck. Changed by a simple adjustment of the handle.